Back in August I flew through BWI and saw this at a place called the Pepper Palace. I saw it had Carolina reaper as an ingredient (the hottest pepper in the world) and was intrigued. Did a little research and discovered it’s 6 million scoville, the hottest hot sauce in the world that isn’t just pure extract. It’s 1,200 times hotter than a jalapeno, 40 times hotter than a habanero, 4 times hotter than a reaper. I love hot sauce (I go through multiple bottles a month) so I couldn’t resist, when I flew through BWI again on Monday I grabbed a bottle. I didn’t open it until today because I wanted to wait for the weekend when I would have adequate “recovery time.” Just in case. There’s a “The End” challenge, which is to take a drop straight. I’m dumb, so I went for it. The first thing I noticed was the flavor. The sauce has flavor and it’s good! It tastes like chipotle peppers, and the flavor is strong. This is a trap. While you’re focusing on the flavor the sauce is turning the dial on your mouth to broil and dumping thermite on your tongue. Next thing I knew I was doing my best “Terry Crews Old Spice” impression. Fire. Everything on fire. This was just the sauce’s opening act. As the heat finally began to dissipate in my mouth I noticed there was a strange warm feeling slowly crawling down my throat. 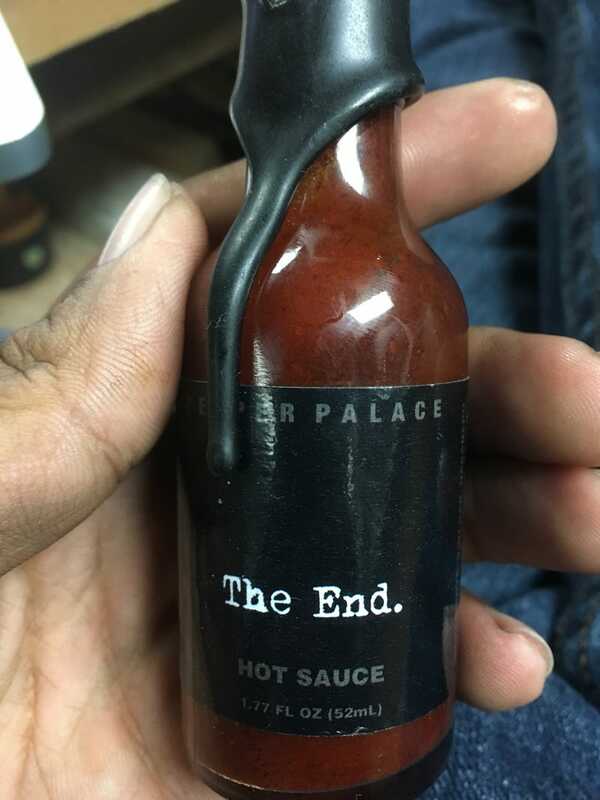 I’ve had a lot of hot sauces, but I’ve never felt this before. It wasn’t unbearable, but it was uncomfortable, and persistent, slowly descending through my chest over the course of minutes. Then it dropped into my stomach. The pain was immense, I started eyeing the trash can, wondering if I was about to be hanging off of it. It was like I had a stomach full of mentos, cola, pop rocks, a baking soda volcano, and napalm. At the same time my nose suddenly turned into a faucet. Without warning and in a matter of seconds mucus was pouring out of my nose and dripping on the floor. I grabbed some paper towels to blow my nose and when I blew the sauce went into my nose. I could feel my nose hairs combusting one by one. My eyes started watering. All the while my stomach continued to try to turn itself inside out. Finally, after fifteen minutes or so the pain in my stomach subsided. The relief was immense. The feeling didn’t go away completely, but I was no longer eyeing the third floor window as a viable option to make it stop. Now, over an hour later I feel mostly fine, though I’m still burping occasionally and I can still feel it brewing in my gut. I suspect my next visit to the bathroom will be soon and very eventful. If you like stupid hot sauces this is definitely the best, both in flavor and intensity. Despite the pain I intend to finish the bottle (slowly and with food). If you’re considering it, definitely give it a go. Just make sure you’ve got a day (or two) with no other plans and you’re stocked up on toilet paper.